Sugar free is no longer sweet free as talented bakers and confectioners now create delicious naturally sweetened treats. Some of our favourites are included in this gift box. Chocolate fans will savour three types of chocolate - milk, dark and white - all naturally sweetened with stevia, and there are also no added sugar alternatives to family favourites like chocolate eclairs, strawberry and cream drops, peppermints and more. Confused? We define the difference between, sugar-free, low sugar and no sugar added here. 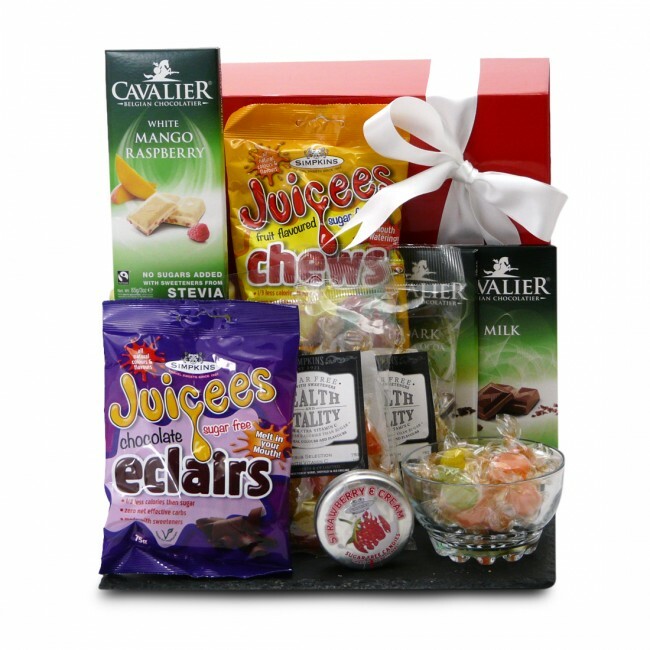 The sugar free chocolate and sweets in this Sweet Selection Box for diabetics are carefully packed by hand in an elegant wicker basket.